Surviving are many cousins and dear friends. Funeral Services will be held at 2:00 p.m. on Saturday, April 13, 2019 at the Cowden Christian Church with Pastor Nate Harper officiating. Burial will take place in Hubbartt Cemetery in rural Beecher City. 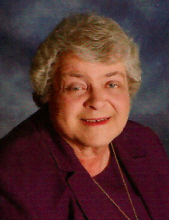 Visitation will be from 1:00 p.m. until the time of service at the Cowden Christian Church. Memorials may be made in Nola’s name to the Beecher City Branch Library, 1358 East State Highway 33, Beecher City, IL 62414. Family and friends are invited to light a candle or share a story in Nola’s honor at www.lockartgreenfuneralhome.com. To send flowers or a remembrance gift to the family of Nola Larimore, please visit our Tribute Store. "Email Address" would like to share the life celebration of Nola Larimore. Click on the "link" to go to share a favorite memory or leave a condolence message for the family.